Bird Songs on CD from Neville Recording :John Neville is a nature recordist, author and birding festival presenter. He creates regional soundscapes of the birdsongs to help people identify what they hear around them . 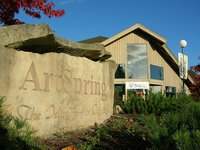 ArtSpring - Salt Spring Island’s premier venue for concerts, theatre, exhibitions - and much more!